Every year, police take millions of dollars from ordinary Chicagoans and spend it behind closed doors. When the clerk called Willie Mae Swansey's case in a crowded courtroom last February, the 72-year-old approached the judge slowly, supporting herself with a four-pronged cane. It had been a busy afternoon in the Daley Center's civil forfeiture courtroom, with more than a dozen quick hearings and a pair of trials preceding her own. The crush of defense lawyers and hopeful claimants had thinned by the time Swansey stepped up to the bench. She steadied herself beside a prosecutor and stood with a stately straightening of her back. Swansey was here to reclaim her car. The Chicago Police Department had seized the 2001 Chrysler PT Cruiser two years prior, arresting the driver, Swansey's son, and charging him with manufacturing or delivering 15 to 100 grams of heroin. The car had been impounded ever since. Swansey herself was never charged with a crime, and it was her name, not her son's, on the title. All the same, the Cook County state's attorney's office had agreed with CPD that the vehicle, which the office valued at $1,400, was worth keeping for good. Swansey was prepared to tell the court that her 53-year-old son, Vincent Turner, had taken her keys without her permission. She wanted to explain that she needed her car not only for basic needs like groceries and laundry, but also because she and her granddaughter, whom she cares for, make frequent trips to doctors' offices and hospitals. Swansey suffers from congestive heart failure, while her granddaughter has cerebral palsy and experiences frequent seizures. She wanted also to stress she had no knowledge that her son had drugs in her car. "Ain't no way I'd let them take my car for drugs," Swansey later said. "That's not me. I'm not that kind of person." But at her February trial date, she wasn't allowed to argue her case. The judge simply asked if her son's criminal case had been resolved. It hadn't, so by law, the judge was allowed to delay the civil litigation until after the criminal case was over. They would reconvene in two months, the judge said. This was the ninth time Swansey had appeared in civil forfeiture court and the ninth time she was told she'd have to come back. A lawyer, had she been able to hire one, could have filed a hardship motion that would allow Swansey access to the car while she waited. A lawyer might have also convinced a judge to hear the case immediately, since Swansey didn't plan to contest the allegations against her son. But for the fixed-income retiree, hiring a lawyer was not an option. "I'm a poor black woman," Swansey says. "I don't have no money for an attorney." Instead, she continued to represent herself. At her next appearance in May, she informed the court that her son's criminal case was over. He had pleaded guilty, and having been under house arrest for 745 days, he was credited with time served and put on probation, according to county records. So on June 30, Swansey's trial date finally arrived, two years and four months after CPD took her car. She had brought her son with her to court to testify that he had taken her keys without her knowledge. But the judge she saw that day, Paul Karkula, didn't want to hear from him, she says. The decision struck Swansey as racist and deeply unfair. Swansey says she watched as four other cases that day were called and resolved, including one involving a wheelchair-bound white woman with a case very similar to hers. This woman got her car back, Swansey says. She did not. "Don't get me wrong—I'm the type of person that stands up for what's right. If this happened a second time, by all means, take my car," she says. "But nothing like this had ever happened to me. I didn't deserve this." After cars like Swansey's are sold, the proceeds are split between CPD, the Cook County state's attorney's office, and the Illinois State Police, which handles the accounting and disbursement of such funds as well as the sale of forfeited vehicles. Civil forfeiture, as the process is known, allows police and prosecutors to permanently keep any cash, vehicles, or other goods seized during a traffic stop or investigation. As long as they believe the money is tied to a crime, they can move to keep the property, even in cases like Swansey's, in which the owner was neither arrested nor charged with a crime. There are thousands of civil forfeiture cases like Swansey's in Chicago and Illinois—and likely tens of thousands more across the country each year. (Exact figures aren't available, as many states aren't required to track or publicly disclose this information.) As previously documented by publications such as the Washington Post and the New Yorker, the widespread use of civil forfeiture reaps billions of dollars of revenue annually for law enforcement agencies across the country. Now the Reader has documented for the first time the full size and scope of CPD's civil forfeiture program—how much money it brings in and how it spends its take. Through numerous Freedom of Information Act requests, the Reader, working with the Chicago-based transparency nonprofit Lucy Parsons Labs and the public records website MuckRock, obtained more than 1,000 pages of CPD documents—including the department's deposit and expenditure ledgers, internal e-mails, and purchasing records—that offer an unprecedented look into how Chicago police and the Cook County state's attorney's office make lucrative use of civil asset forfeiture. Since 2009, the year CPD began keeping electronic records of its forfeiture accounts, the department has brought in nearly $72 million in cash and assets through civil forfeiture, keeping nearly $47 million for itself and sending on almost $18 million to the Cook County state's attorney's office and almost $7.2 million to the Illinois State Police, according to our analysis of CPD records. The Chicago Police Department doesn't disclose its forfeiture income or expenditures to the public, and doesn't account for it in its official budget. Instead, CPD's Bureau of Organized Crime, the division tasked with drug- and gang-related investigations, oversees the forfeiture fund in what amounts to a secret budget—an off-the-books stream of income used to supplement the bureau's public budget. The amount of money seized from any given individual is, by itself, negligible to police and prosecutors' budgets—the median value of a forfeiture in Illinois is $530, according to the Institute for Justice, a nonprofit Libertarian public-interest law firm. But losing this sum of money or access to a vehicle can be devastating to the impoverished people civil forfeiture often affects. And in Chicago the millions of dollars accumulated through so many individual seizures don't go toward public services like schools or roads, but are used to fund the operations of the police division that carries out civil forfeiture. Even without forfeiture income, the Chicago Police Department gets more money from the city than any other city department. (Chicago Public Schools' budget is much larger, but the district is its own taxing entity, financially separate from the city.) Last year's CPD budget totaled $1.4 billion, 5 percent greater than the year before. As with all city agencies, CPD's budget is proposed by the mayor and vetted by the City Council, a separation of powers intended to provide checks and balances. But income obtained through civil forfeiture falls outside the bounds of normal accountability. This secret budget isn't scrutinized by the City Council, nor must CPD make any public disclosures about how these funds are spent. While the additional income is small compared to the department's full budget, CPD's forfeiture account is controlled entirely by the Bureau of Organized Crime. The extra $4.7 million to $9.3 million collected annually through forfeitures between 2009 and 2015 adds substantially to the bureau's ledger. In 2015, the bureau received a little more than $77 million in its official budget. That year's forfeiture income was close to $4.7 million, equal to 6 percent of its total public budget. On top of that, the forfeiture fund was already flush with cash from previous years; at the end of 2015, the bureau had more than $16 million in its forfeiture checking and savings accounts, according to deposit records obtained by the Reader. Until recently, the man responsible for approving purchases made with CPD's forfeiture money was Nicholas Roti, who spent more than 28 years with the department, including five as the chief of the Bureau of Organized Crime from 2010 to 2015. Roti has also been at the center of two recent controversies, the first a high-profile lawsuit by former narcotics officers who claimed they'd been harassed and shamed after helping the FBI investigate and ultimately convict crooked cops within their division. The officers alleged that Roti, then the commander of the narcotics unit, pledged never to allow them to work under him again. The city settled the lawsuit for $2 million in May. Then, in March 2015, the Guardian newspaper described the narcotics unit's home facility of Homan Square as an "interrogation warehouse" and "black site" where victims were denied their right to a lawyer and subjected to abuse. Roti resigned from the police department after the allegations were made. His successor, Anthony Riccio, now signs off on such purchases, as did Ernest Brown, Roti's predecessor. Click a wedge to see data breakdown. Click the center circle to return to full graph. The Reader obtained payment requests for all bureau purchases greater than $5,000 made with forfeiture money since 2010. CPD spent close to $25.3 million in forfeiture money during this time, $22.1 million of which was spent in increments of more than $5,000. The Reader was able to classify more than 80 percent of these larger purchases, but because of redactions or vague information in some documents, roughly 20 percent of them remain unknown. More than 90 percent of the money spent on known larger purchases was devoted to day-to-day operations and expenses, such as vehicle repairs and the purchase of computer servers. For example: On November 18, 2014, Kenneth Angarone, a commander within the Bureau of Organized Crime, requested $102,644.73 in forfeiture funds to pay for Enterprise rental cars, which Roti approved. Angarone's request explained that the rental cars would be used by the narcotics and gang divisions, asset forfeiture units, and administrators. Such rental car leases have accounted for more than $7.6 million of forfeiture expenditures since 2010. The cell-phone bills of undercover officers account for another huge day-to-day expense paid for with forfeiture proceeds. On December 31, 2014, Roti approved a request for $19,015.98 to pay for one month's worth of phones "used by undercover officers performing drug and gang enforcement operations." Similar requests were approved nearly every month, amounting to more than $3.2 million worth of forfeiture expenditures since 2010. Perhaps it was to help keep track of such expenditures that the Bureau of Organized Crime's narcotics division bought itself a money-counting machine in July 2014. 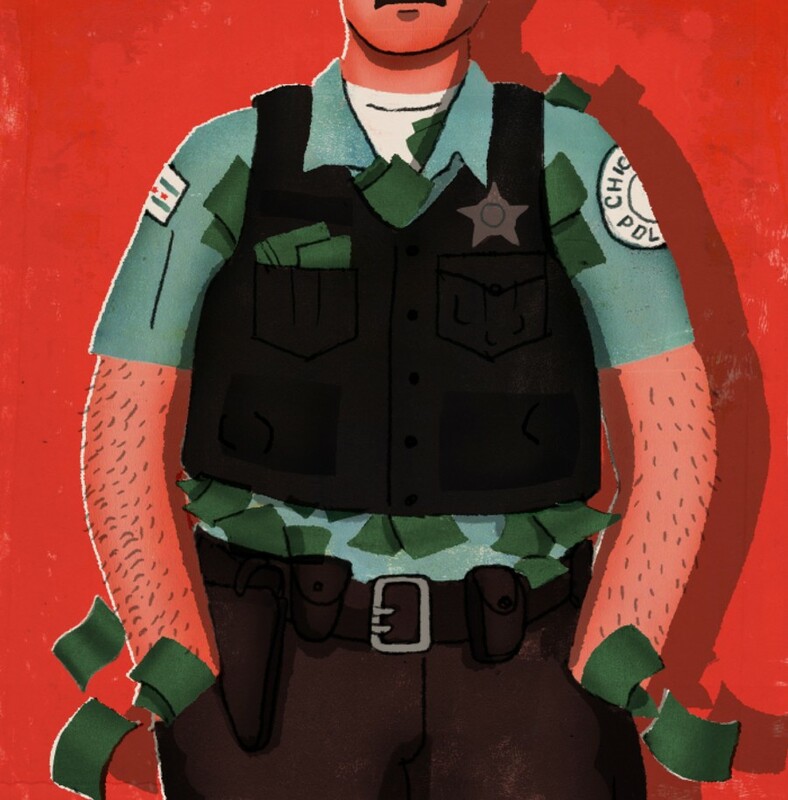 When a government agency is allowed to handle the forfeiture proceeds it brings in—as is the case with both CPD and the Cook County state's attorney's office—it controls both "the sword and the purse," like an army that is also its own taxing authority. This is according to Lee McGrath, legislative counsel for the Institute for Justice, which seeks to reform civil asset forfeiture laws across the country. Allowing law enforcement to appropriate its own forfeiture funds circumvents "the traditional democratic processes of the legislature, because law enforcement can set its own priorities and raise its own money without scrutiny," McGrath says. In CPD's case, the Bureau of Organized Crime can spend its forfeiture income in any way it sees fit, as long as some connection to gang or narcotics investigations can be made. Only internal approval is necessary. Ben Ruddell, a policy lawyer for the American Civil Liberties Union of Illinois, has been studying the state's civil forfeiture statute as he works to draft a reform bill. He sees CPD and other law enforcement agencies' control of their own forfeiture revenue as a huge problem. "Other states have passed legislation to mitigate this incentive by requiring forfeiture income to go toward the general operating budget of the municipality or state, or into special funds for education or drug treatment," Ruddell says. "As it stands, CPD is free to use its forfeiture income at will, and outside of the public eye." While the Bureau of Organized Crime spends much of the department's forfeiture money on day-to-day expenses, the Reader's analysis shows that $1.86 million, or 9 percent of known expenditures, goes to fund invasive surveillance equipment the department shields from public view. This surveillance technology includes devices that track and access cell phones, as well as license-plate-reading cameras that monitor the locations of vehicles. Cellebrite is an Israeli forensics firm that makes technology that allows law enforcement agencies to access the contents of cell phones, such as pictures, text messages, and call logs. (The company made news earlier this year when it was rumored to have helped the FBI crack the iPhone belonging to one of the San Bernardino shooters, although that was later shown to be untrue.) Records released to Lucy Parsons Labs in June 2015 show that the Bureau of Organized Crime bought technology from Cellebrite as early as 2009, when the bureau was known as the Organized Crime Division. In a November 2009 payment request, a bureau sergeant sought approval to pay for the purchase with forfeiture funds from the division's then-chief, Ernest Brown. Because the Cellebrite kit would be "utilized during the course of narcotic related investigations as well as detective division investigations," the sergeant requested the use of forfeiture funds. Brown, along with then-deputy chief Roti, approved the request. On November 30, 2012, Roti authorized a request for forfeiture funds to pay for wiretapping equipment made by the technology firm Pen-Link. The request included a bold-print disclaimer, similar to ones that appear on all such secret requests for forfeiture-funded technology obtained by the Reader: "These items are of a covert nature and knowledge of their existence should be kept within the Bureau of Organized Crime and limited to sworn personnel." In total, CPD has paid more than $411,000 in forfeiture money to Pen-Link since 2010. CPD first began to use surveillance devices that track license plates and catalog the locations of passing vehicles in real-time in 2006. The technology, known as Automatic License Plate Readers, was heralded by then-CPD superintendent Phil Cline. Speaking at the City Club in September of that year, Cline boasted that in the first three months of using the readers, CPD had "checked more than 142,000 license plates." But since then, CPD has concealed the purchases of the cameras themselves, as well its subscriptions to national databases that collect and sell the location data gleaned from private and law-enforcement ALPR systems. An April 2015 e-mail sent by a sergeant in CPD and the city's shared technology unit indicates that four of the department's ALPR units were paid for with forfeiture proceeds. A stand-alone ALPR system, also purchased with forfeiture money, was installed at Homan Square in 2010, according to a payment sheet obtained by the Reader. Perhaps the most controversial surveillance technology used by CPD is the cell-site simulator, commonly referred to by branded device names including Stingray. The device scoops up information from any nearby cell phones indiscriminately, meaning that information from untargeted and innocent people in the area is collected in the course of their operation. It can also deny service to phones in the vicinity, gather location data, and intercept calls and messages. Chicago police have purchased more than $417,000 worth of cell-site simulator equipment since 2010, exclusively with the use of forfeiture money. In July, Governor Bruce Rauner signed a bill, championed by the Illinois ACLU, which demands that police get a warrant for Stingray-enabled investigations and otherwise restricts the use of such devices. Asked about the role of forfeiture money in the procurement of the technology, the civil liberties group's policy attorney Ruddell says: "When you have tools being acquired in ways that are not subject to oversight, that's a real concern." Ruddell and others are now making attempts to reform civil forfeiture in Illinois. The myriad problems they see in the process include not only the reporting and disbursement of forfeiture income, but also a legal process that is stacked against claimants like Willie Mae Swansey. When a Chicago police officer seizes a person's car, the department has just five days to notify the Cook County state's attorney's office if it wants to seek permanent forfeiture. That period jumps up to 52 days if it's cash the police want to keep. (Either way, within 14 days of the initial seizure, a judge will determine whether the police and the prosecutors have probable cause to keep the assets.) The state's attorney's office then has 45 days to notify all potential claimants that the state is moving to keep their cash, vehicle, or other asset. In order to have a chance at getting their property returned, claimants must put down a bond toward their asset when first submitting the official paperwork. This means that Swansey had to pay $140 (10 percent of her car's value) just to start the process. Then, to appear in court, she had to pay an additional $177 fee. To Swansey, who lives on a $655-per-month social security check, these costs are substantial. Successful claimants will have 90 percent of their bond returned; unsuccessful claimants get nothing back. "This is just a shame," Swansey says. "It's a rip-off." Like Swansey, most claimants can't afford lawyers to help them navigate the often confusing process. Because it's a civil proceeding, and not a criminal trial, the state offers no public defenders. "You see a lot of poor people that are unrepresented, that are representing themselves," says Jonathan Brayman, a criminal defense attorney with the law firm Breen & Pugh who has argued many civil forfeiture cases at the Daley Center. Although Brayman and others in his practice have been successful at forfeiture court, "it's tough to prevail," he says. Even with a lawyer, the claimant's burden of proof is so high that it often makes more sense to accept a settlement worth a fraction of what was taken. Whereas prosecutors only need to meet the legal standard of probable cause—the same low bar police officers must meet in order to search a vehicle—Swansey and other claimants must show a preponderance of the evidence—a more stringent legal standard than probable cause—to prove they obtained their money legally or that they didn't know their car was used in a crime. Brayman has helped argue two class-action lawsuits—Gates v. City of Chicago and Anita Alvarez v. Smith—that brought some relief to people trying to navigate the forfeiture process. Gates, which included a class of nearly 40,000 plaintiffs, forced CPD to better account for assets when they are first seized from arrestees, while Smith shortened the length of time the Cook County state's attorney's office had to notify potential claimants and schedule hearings for those hoping to have their assets returned. In hearing Smith, the U.S. Supreme Court noted that claimants in Illinois could be forced to wait up to 142 days before forfeiture proceedings began, while members of the Smith lawsuit waited between 11 and 40 months for their cases to be resolved. But reform efforts that seek to limit or end civil asset forfeiture in Illinois must confront a cluster of state laws that include forfeiture provisions, such as those for driving with a suspended license and the sale of counterfeit goods, as well as numerous drug laws like the Cannabis Control Act and the Controlled Substance Act. "There are probably 25 or so statutes in the code that authorize some form of forfeiture," Ruddell says. "It's just like this many-tentacled beast." There's also the assemblage of prosecutor and police associations—including the Illinois State's Attorneys Association and the Illinois Drug Enforcement Officers Association—and their allies in the legislature, which want to ensure that civil forfeiture can continue unabated. Recent reform legislation in Springfield has been met with opposition from these groups, as well as from the Cook County state's attorney's office. Ruddell has spent much of the past year drafting a comprehensive reform bill that he hopes to get introduced early next year. He knows well the lobbyists that will fight the legislation, because he used to work with them as a staffer in the House Republican leader's office. Any measure will face "the full brunt of law enforcement opposition across the board, no matter how modest or sweeping the reform is that you're proposing," Ruddell says. Neither CPD nor outgoing Cook County state's attorney Anita Alvarez would comment for this story. Kim Foxx, who defeated Alvarez in March's primary election after touting her "transformative" approach to reforming the criminal-justice system, also declined to comment on civil forfeiture. But Eric Carter, then deputy chief of CPD's Bureau of Organized Crime, defended civil forfeiture at a 2015 conference for the International Association of Chiefs of Police. "It's not policing for profit," Carter said, "but you wanna be able to say, if I'm going to cripple an organization and arrest everybody, I want to take every viable means they have of trying to recoup and come back. I want to eliminate them totally and take their assets." The Institute for Justice's McGrath sees this argument as a canard. "Nearly all of the reforms that the ACLU and my law firm and others are advocating do not change seizure laws," McGrath says. Under such reforms, police could still seize anything they believe to be tied to a crime. Prosecutors would just have to secure a criminal conviction before someone's property could be forfeited. In April, McGrath was in Springfield to testify against Illinois's poor reporting mechanisms for both seizures and forfeitures, as well as the incentives police and prosecutors have to reap the benefits of forfeited assets. The Institute for Justice has given Illinois's use of forfeiture an overall grade of D-. In recent years, 11 states have passed legislation that limits the practice of civil forfeiture, with the most sweeping reform having passed in April in New Mexico. McGrath calls that bill "the platinum standard of forfeiture reform." New Mexico's law eliminates incentives for police and prosecutors by directing all forfeiture proceeds to the state's general operating fund, and closes loopholes that have marred similar laws in other states. Most strikingly, New Mexico's law bans civil forfeiture entirely, allowing only those assets that can be proven to be tied to a crime—in criminal court, beyond a reasonable doubt—to be permanently lost to the state. Only Nebraska has passed a law as far-reaching, while nine other states require that a criminal case from which a civil forfeiture case arises must end in a conviction before the civil case proceeds. Ruddell says that New Mexico's is a "great law," but cautions that it was the result of a "perfect storm" of political winds that allowed it to pass without strong opposition from law enforcement. Ruddell hopes the Illinois ACLU's legislation will at least make sure that a civil case ends if the criminal case doesn't result in a conviction. Navigating the legal status quo on her own and subsequently losing her car has left Swansey with few avenues to reclaim her freedom of movement. Relying on friends and family for rides is a burden, but she says she can't afford to buy a new vehicle. She looked into filing an appeal herself, but says she's worried about navigating the appeals process without a lawyer. She called a legal aid group that may be interested in taking her appeal, but for now is waiting to hear back. Read a full account of our FOIA process here. He wears $5,000 suits and is chauffeured to court in a Rolls-Royce. He’s made a fortune off the war on drugs. He claims Oprah once wanted to have his baby. He is the most interesting lawyer in Chicago. But who’s the man behind the megawatt smile? Whatever happened to Kim Foxx? Should cops provide first aid to people they shoot? A debate has emerged as more and more videos show victims bleeding to death before an ambulance arrives. CPD’s hush-hush slush fund surprises city leaders. The Reader, Lucy Parsons Labs, and MuckRock teamed up to FOIA thousands of pages of documents detailing the Chicago Police Department’s use of civil forfeiture money. The Illinois legislature could vote again this week on whether to allow drones equipped with controversial facial recognition software to monitor large public events.